NAPA, Calif. -- Sonoma County officials preached patience on Monday for residents still displaced by several wildfires that continue to burn in the North Bay. At an afternoon briefing at the Sonoma County Fairgrounds in Santa Rosa, city, county and state officials provided an update on the deadly and destructive fires that sparked Oct. 8. The county's death toll from the fires remains at 22 but 88 other people remain missing, Sheriff Rob Giordano said. Sheriff's deputies and members of the National Guard are doing targeted searches for the missing people as well as general searches of burned-out neighborhoods, Giordano said. "We don't want to miss a person," he said. Giordano said there is "a lot of pressure" from residents wanting to get back to check on their homes but he said it will be days or weeks before they can do so in many cases. Santa Rosa Mayor Chris Coursey said 689 residents in the city are staying in shelters as of today. Coursey thanked people for bringing supplies to the shelters but said they are no longer accepting donations at any city shelters. Sonoma County Supervisor Shirlee Zane said a local assistance center set up at the Santa Rosa Press Democrat building at 427 Mendocino Ave. served 236 people this morning alone and many more since opening Saturday. 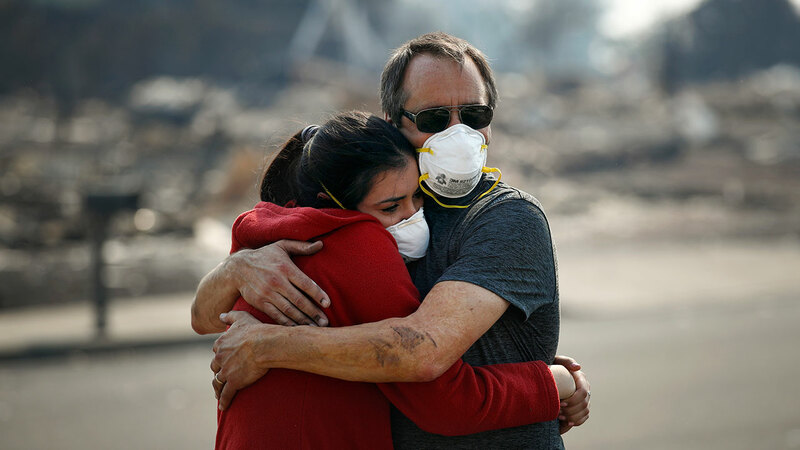 The center provides a variety of services, including document replacement and help accessing federal aid, for people recovering from the fires. Zane said the county's hotline has received thousands of calls since Oct. 8, but the calls recently have changed from ones with questions about evacuations to ones about coping with the devastation wrought by the fires. "The shock has worn off and the sadness and depression and overwhelming loss is beginning to set in," she said. Zane encouraged anyone having problems coping with the fires to call the county's mental health hotline at (707) 565-6900. Among other updates in Sonoma County, Santa Rosa Fire Chief Tony Gossner said the pharmacy has reopened at Kaiser Permanente's Santa Rosa Medical Center at 401 Bicentennial Way but the hospital itself remains closed. Buses are taking residents at evacuation shelters to and from the local assistance center, and parking is also free for vehicles at a city lot off of B Street near the center. More information for residents in Santa Rosa can be found here. Click here for full coverage of the North Bay fires.